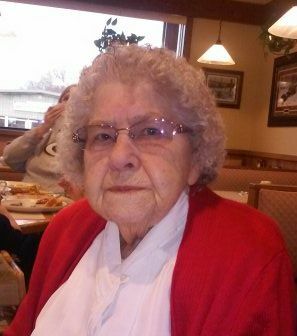 Obituary for Marian E. (Olson) Stiel | Peterson Kraemer Funeral Homes & Crematory Inc.
Marian E. Stiel, 90, Wausau, died Thursday, January 24, 2019 at North Central Health Care Center, Wausau. She was born November 21, 1928 in Chelsea, to the late Bernard and Hildegard (Meyer) Olson. On September 6, 1946 she married Sylvester Stiel at St. John Catholic Church in Rib Lake. He preceded her in death on April 9, 2010. For many years, Marian worked as a waitress and cook at local restaurants including Kresge’s in Wausau and later at K-Mart. She enjoyed jigsaw puzzles, reading, camping and attending local stock car races. Survivors include her son John (Joan) Stiel, Wausau, daughters Linda Krause, Schofield and Judy Stiel, Deerbrook, 11 grandchildren and 16 great grandchildren. Besides her husband and parents, she was preceded in death by her daughter, Janice Oleson, sons-in-law, Gerald Oleson and Rick Krause, her siblings, Marvin, Norman, Harry and Harold Olson and Evelyn Thums and Myrtle Tripp. The Funeral Mass will be celebrated at 11:00 a.m. Tuesday, January 29, 2019 at the Church of the Holy Name of Jesus, Wausau. Rev. Peter Kieffer will preside. Entombment will be in the Memorial Chapel Mausoleum, Restlawn Memorial Park, Wausau. Friends may call on Tuesday from 9:30 a.m. until the time of service all at the church. Peterson/Kraemer Funeral Home, 1302 Sixth Street, Wausau is in charge of arrangements. Online condolences may be expressed at www.petersonkraemer.com.